Junior, Misses, Missy, Women’s, Plus, Petite, Tall – What size am I? With so many size types, where should I begin? How do I know what size clothes to try on, or buy from the website? There is so much confusion on women’s sizing. There is simply no standard size chart for all clothes – we are different heights, weights, proportions, and shapes. I have created this handy chart comparing several different stores sizes to demonstrate how to determine what size clothes to try on. The first step is to know your measurements. Here is a quick tutorial on How to Measure Yourself. You will need all of your measurements, but for this session we will focus on waist measurement only. The style of jean or pants will be largely based on the hip measurement (curvy, straight, low rise, high waist, etc), but the waist measurement tends to be the real deal breaker for fit. Chest or Bust measurements are obviously important for shirts and dresses. These are simply guidelines from each store, a starting point only. The waist of the garment may sit a bit lower or higher for a skirt versus jeans even with the same brand! Waist size 27-28 inches are consistently a size 6, due largely to the fact that clothing manufacturers tend to treat size 4 or 6 as the ideal size. 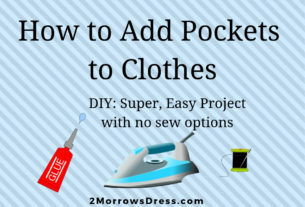 Many garments are made for size 4 or 6 as the prototype, then adjusted up and down for the other sizes available. As you can see from the chart, Women’s Plus sizes are the most confusing! Old Navy Women’s Plus is able to accommodate the largest waist size of all the selected stores in our chart. 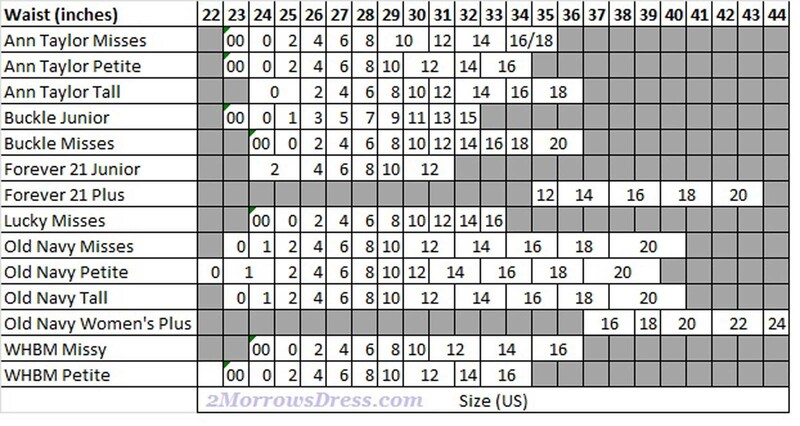 Many Plus size stores have even created their own custom size chart, like this one from Torrid. Once you have your exact measurements, then review the sizing chart from each store. Know which stores tend to be close on sizes, Lucky brand jeans run smaller than many stores. And converting from a Junior size 5 frequently goes up to a Misses size 6 based on waist, and a less curvy/straight torso may be able to size down to a 4 depending on the hips. It is no wonder that Women’s clothing (and sizes) are so confusing. The best advice is to find a few brands & stores that fit your overall shape (curvy, tall, pear, petite, whatever) and then focus in on the size or 2 that best fits you. Each season, or shopping trip, will be easier since you will know what size for that brand and style that fit last time. Remember to reevaluate brands & sizes for any significant weight loss or gain, as well as more curves (hips tend to “fill out” in your 20’s).